The Economist launched a new version of their homepage a couple weeks ago. Their designers had an interesting challenge – taking a premium, text heavy weekly and making it work on a web obsessed with the visual, social, and real-time. They loosened the paywall, added more daily content updates, and moved the site away from being simply an online reflection of their print publication. You can read a description of the new design on their site. Here's my view. The top menu bar is clear, logical, and maps to the magazine sections with which I am familiar. The old design had a redundant left rail which has been removed, leaving room to showcase charts, breaking news, and video. The centre column contains bundles of stories, each relevant to an important topic in the current week’s issue. This makes is very simple for me to scan the page, identify topics or sections of interest, and click through. This layout is maintained on the sub pages underneath (although the left most column disappears). The old website felt like a nearly static snapshot of the current print issue. The new design feels grounded in the print issue, but also feels more up to the minute. The content does evolve throughout the week. The current week’s issue identifies what’s important – the European banking system, for example – and then the website tracks new developments on each topic throughout the week. The image and three headlines near the top left of the page gives the Economist a large space to showcase it’s most current or important stories in a very visual way. It could benefit from some visual refinement; for example, the odd size of the image, and relatively large headline typeface, means that the space is often programmed with images that are badly cropped and headlines that seem too short. 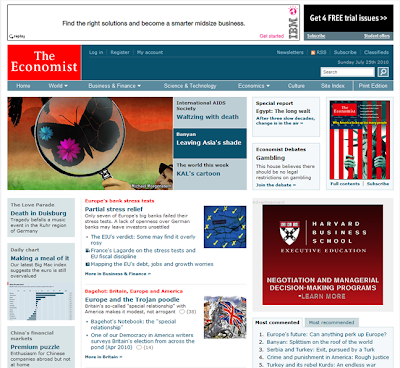 The Economist websites have always made odd use of typeface and borders. The end result is a lot of odd whitespace shapes, and a general feeling that the repeated bits of the page – the header, promotional areas in the top right, and charts on the left rail – are just a collection of boxes. The home page needs “a day at the spa” to smooth out some of these wrinkles, and make these recurring elements feel more like part of a continuous whole. The redesign is a big step in the right direction. The execution is a bit rough in spots, but you can see that the team understands that they need to build on the excellent analytical writing to create a site that is a rational, well-thought out (if opinionated) intrepretation of current events. evolve over time. It's nice to see a publication that you love get so many things right. What they really need is a product manager consultant who understands british spelling.